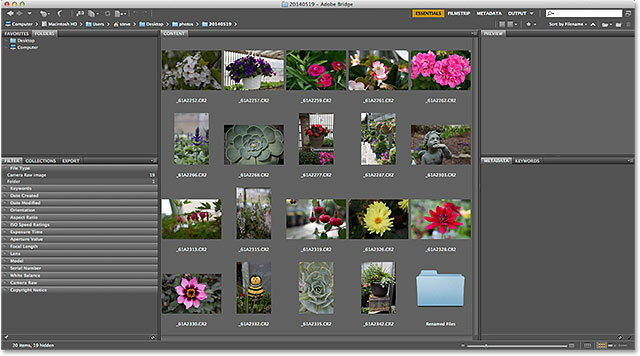 In this tutorial, we'll learn how to quickly rename multiple image files at once using the powerful Batch Rename feature in Adobe Bridge, a free companion program included with every version of Photoshop. 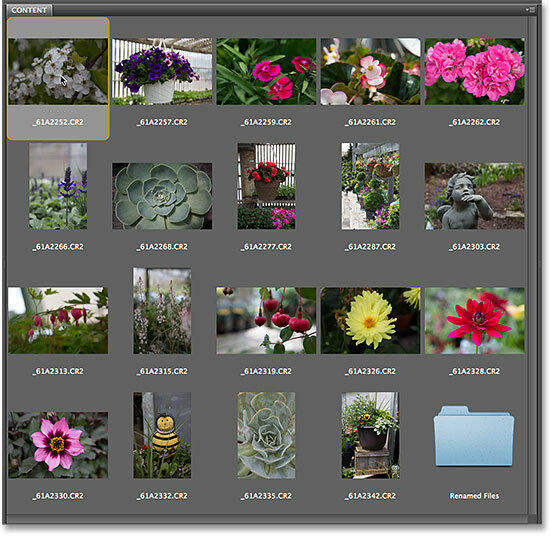 Previously, we learned how to transfer photos from your camera or memory card to the computer using the Adobe Photo Downloader, and we saw that one of the features available to us in the Photo Downloader is the ability to rename the files as they're being transferred. In that tutorial, though, I mentioned that it's often better to wait until you've had a chance to browse through your images and delete the ones you don't plan on keeping before renaming them. That way, you can rename the keepers as a continuous sequence, without any gaps between one image number and the next. When you are ready to rename them, the fastest and most flexible way to do it is with the Batch Rename command. As we'll see, the Batch Rename function in Adobe Bridge allows us to create any sort of file name structure we need, from simple to highly detailed. It even lets us copy the renamed versions to a separate folder to preserve the originals, and save our custom naming structures as presets to quickly access again whenever we need them. I'll be using Adobe Bridge CS6 here, included with Photoshop CS6, but this tutorial is compatible with any recent version including Adobe Bridge CC (Creative Cloud). Let's get started! Navigate to the folder containing your images. Clicking on the first image in the list to select it. Pressing and holding Shift and clicking on the last image to select them all. Going to Tools > Batch Rename. The Destination Folder section set to "Rename in same folder". Selecting "Copy to another folder", then clicking Browse to choose the folder. The first box on the left selects a main item to add to the file name. Setting the first main option to Text, then entering in some custom text. Adding a sequence number as the second part of the new file name. I mentioned that by default, Adobe Bridge gives us four rows for adding four different items to the file name, but we can add even more if we need them, or we can delete any we don't need. If you look to the far right of each row, you'll see a minus (-) and plus (+) button. Clicking one of the plus buttons will add a new row directly after that specific row in the list. To remove a row you don't need, click on its minus button. Use the plus and minus buttons to add and remove rows as needed. The new file name now contains only two items - custom text and a sequence number. 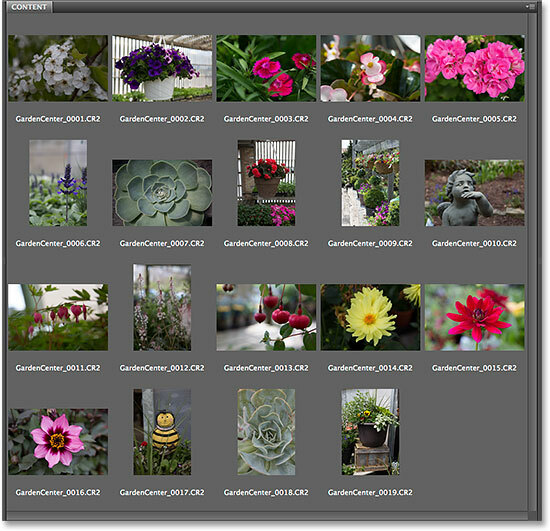 The Preview area showing the current filename and new filename. 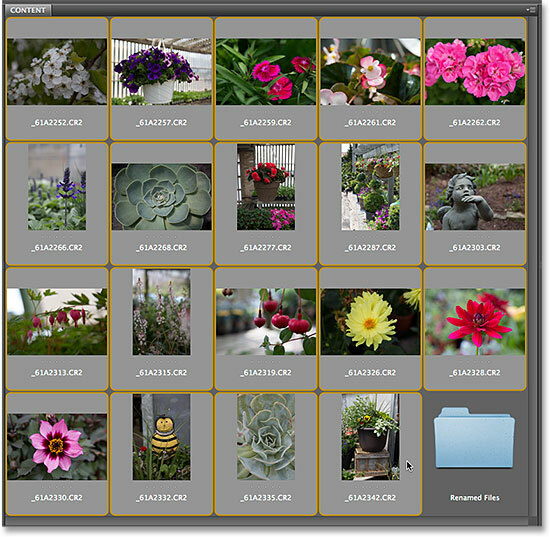 Set Compatibility to both Windows and Mac OS and select Preserve current filename in XMP Metadata. Saving the new naming structure as a preset. The new preset is added. The files have all been renamed. And there we have it! That's how to quickly and easily rename multiple image files at once using the Batch Rename feature in Adobe Bridge!